We are under a severe weather alert right now and the tornado sirens have just started going off so I am going to make this short and sweet. At lease we will have some rain for my new pasture. 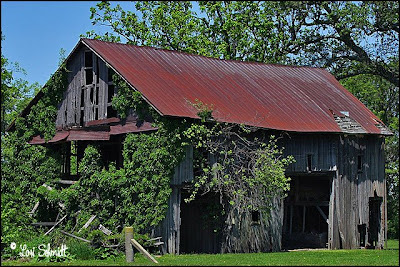 The barn above is an old one down the road a few miles from me which saw when I went to fetch the grass seed from the people nearby. Keep safe everyone and if we are still in one piece tomorrow, see you then. We are trying to get the field down the road cut and baled so that we can take our horses out there I hope it happens soon. One of our neighbors helped me till/lightly plough and disc the one field and plant horse pasture seed and oats, now all we need is some rain!!!! We have had very little, we always appear to be in the little pocket that the rain misses for some reason. Feast or Famine! Well by the time we had finished that and I had fed the horses it was after 9pm! This is becoming the norm for me, I never seem to get to sit down before 9 at night. I had some exciting news tho yesterday. 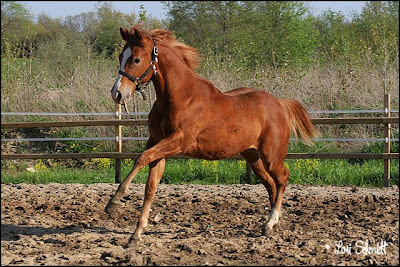 I have always wanted a Palomino horse, I have just always had an attraction for the color. 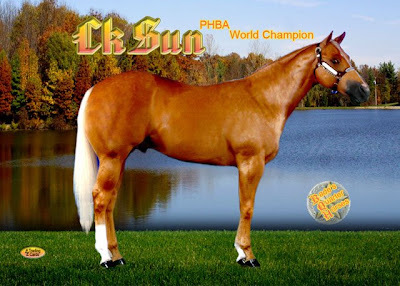 Well we still have two mares in Iowa with a friend that run with his band of brood mares (Quarter horses) and whatever stallion he wants to breed them to that year and it so happens that they shared the huge pasture which has a creek running through it with his Champion Palomino stud CK Sun. The picture is a trading card that Larry made of him for our friends, his details and their name and contact details are on the back of the card. I didnt take this picture, the original photograph was taken by Photographer Jeff Kirkbride who gave us permission to use the photo. Larry cut him out and put him on a new background for the card. Elliot called yesterday evening to tell us that when he went to give the mares their grain he saw the one mare with a baby. She stayed up on the ridge but he could see it is yellow and possibly has a bald (white) face, so we could very possibly have a palomino paint horse (one with spots on it too). This mare is very protective of her babies so it is probably going to be a few days before she brings the baby down to get the grain they get each evening and Elliot can hopefully get some pics of it!!! There is one other mare who is still expecting any day there too. I just want to jump in my truck and drive there, but with gas prices and the fact that he is in northwestern Iowa (about a 9 hour drive), puts a bit of a damper on that idea LOL. Lots of other little things happening, I am still black and Blue from our battle with Blaze on Sunday and loading into the horse trailer. Darlene, the lady who purchased him is very very happy with him, says he has exactly the temperment that she was wanting. He would climb in your pocket if he could and is normally as quiet as a mouse and very clever. Drew who bought Dosie is very happy with him too so maybe we will see him at some of the shows later in the year. The Indiana Pinto Assoc. has their next show in August and then one a month later in September. I have received numerous blogging awards over the past 17 months of blogging and have never gotten around to following them through, and especially when I have got so far behind in my blog reading and commenting and even posting. I am sorry for that because each one has been special to me from my new blogging buddies. I recently found two wonderful blogs that I try to visit as often as possible which are actually written by the same person but the author of these blogs, Strawberry Lane, has offered me this "I Love Your Blog" award for which I thank her. I love your stories and humour and it makes for a pleasant place to have a giggle and a relaxing stop over. Her other blog is Simply Marvelous and is a mine of information and interesting stories. So basically I am turning over a new leaf or trying to and get a blog posted most days like I did last year, there is always something going on here, and I have found it quite a useful way to keep a diary of sorts. If and when I get back to my routine of reading and writing I will pass this award on to three people but at the moment there are so many that I like I cant choose! 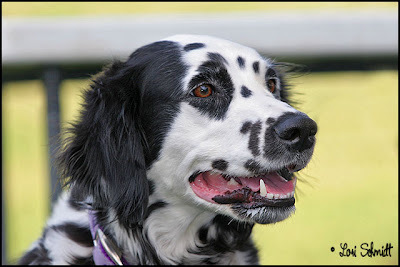 At the horse shows I always find that people will have their dogs and over the years they have made for interesting subjects to shoot. 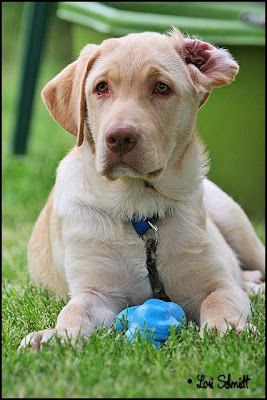 I had the pleasure of meeting this little guy this weekend, he is owned by Alex's family and the dalmation too. I still have more to edit so there are a few more but thought 2 for today would be enough LOL. Still havent unloaded the sawdust!!! So that is on the top of the priority list for tomorrow. 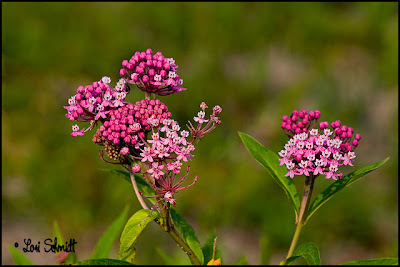 Larry has got all of the pictures up on my website ProPhoto By Lori under the subheading Shows. Most of them are last years pictures still but we will be taking those down and making space for this years'. My next show is another of my favorites which is another stay overnight in Rochester for the Heartland Welsh Pony and Cob Club, (they dont have a website that I know of but the person who originally contracted me for this show was Lisa Brezina of Castleberry Welsh Cobs and Sport Ponies where you will see many of my photos LOL), which I have been shooting for since they initiated their show in 2004, so this will be my 5th time shooting for them. Well that is about it for today, I promise I will take up on my stories of my travels sometime soon, I just can't find any photos, I had scanned very few before coming over to USA and the negatives and slides are in UK with my "friend" who is avoiding me for some unknown reason. Hopefully one day I will get my hands on them again. Photographing my first show of the year is over and I have a few weeks before the next one. 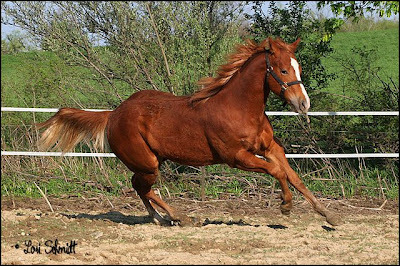 This was a Pinto show (Spotted horses and ponies) and I have been doing their photographs for the past 6 years. They usually have 3 shows a year. 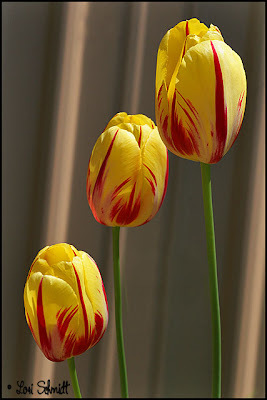 While I was wandering around these tulips caught my eye, I thought they were nice and bright so here they are, I have never seen varigated colors in tulips. Usually I would travel home on the Saturday evening as this is only 60 odd miles from home but with the gas situation being so bad, nearly $4 a gallon one of the members Bobbie Anne (BA) and her husband Nick put me up for the night for which I was very grateful. The picture below is of the pony Little Bit who was bought by the little girl next to him with her own money, Alex, and her great aunt BA. 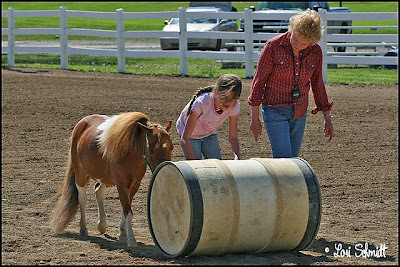 Little Bit has started rolling barrels around in the field at home so we were trying to capture a pic of him doing it here after the barreracing classes on Saturday evening. 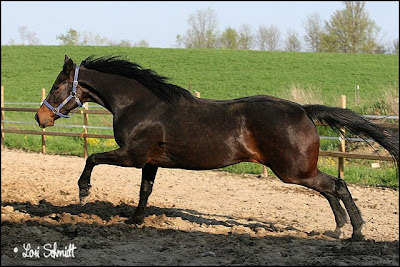 This pony is amazing, he pulls a cart, jumps while being lead on a lead rope and competes in just about all the events that the Minis do and very well. 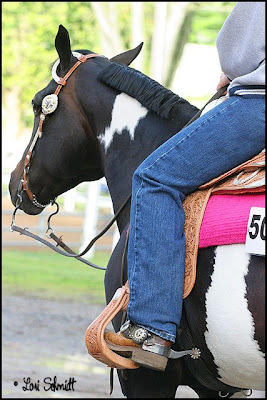 I am always looking for unusual "things" at the shows and love spurs. Although I have never seen any of those really ornate ones that some of the people wear here is one from this weekend and the second one including the horses, head LOL, have to have at least one picture of a horse!! 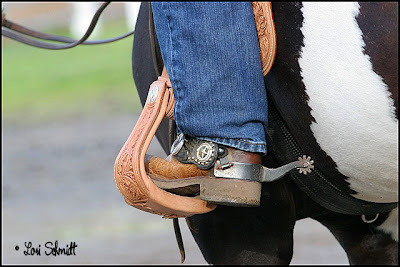 I love the ornate toolwork on the saddles and bridles and the bling that goes with the western riding classes both on the horses tack and the people. The outfits that the riders wear are as important as how the horse performs and looks. Saturday started off raining, I arrived a bit late and missed a few classes but it was indoors so the pictures werent going to be wonderful anyway, I tried my best under the conditions. In the afternoon the sun had come out and they had managed to get the arena dry enough for us to be able to walk in it. It was quite warm but very blustery which was pretty unpleasant to say the least because the maple trees are just dropping their seed pods and we were bombardered with those all weekend. We had an inch of rain on Saturday night which put the arena back where we started but we managed the first classes in the makeup arena which was pretty dry. They were the jumping in hand classes and trail. Then we moved into the large arena for the ridden classes. It was absolutely freezing the whole day. The wind had an arctic chill and I was wearing two shirts and my jacket which thank heavens I took with me and my hands were still freezing. When the wind dropped it was pretty pleasant but it blustered both days unfortunately. I was pretty tired by the time I had driven home and fell asleep at 8pm and woke up at 8am this morning!!! So that is my weekend in a nutshell. Larry is busy getting all the photos up on my website because I was on my own there so couldnt do the sales too. I gave everyone cards with the website address and they can see their proofs there. It started to work pretty well with the shows last year. I am catching up on blogs and mail and am just going out to start feeding the horses their dinner. 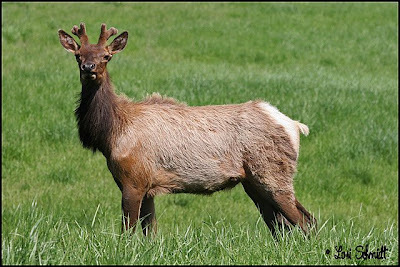 I started the day out feeling a bit blaaaahhhh again LOL, but then got together with a friend I have met recently who likes photography too and we went down to the elk farm to see what was there. I have only ever been there in February when it was cold and the grass brown and snow on the ground. They don't have many animals anymore and we could only see this one small herd of young ones. 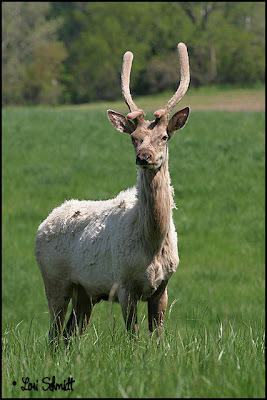 There were 3 white ones (or it might have been 4) and I thought it looked so cute the way their antlers were starting to grow. 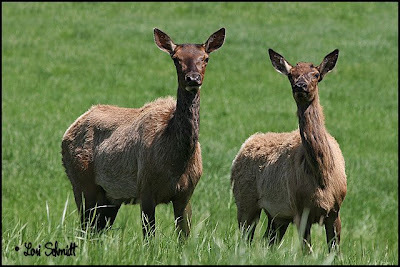 They were a little wary when we first drove up and got up and moved away but we crouched by the fence and they started getting curious and coming closer. Wish I had a 1.4x converter for my 70-200 2.8 LOL. So that is all I have to report today. Am getting ready to close everything down and start packing for the horse show as I will be away from early tomorrow morning until late Sunday. 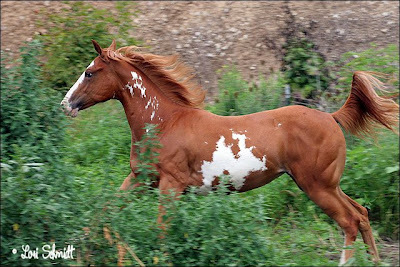 It is one of my favorite shows, the Indiana Pinto Assoc. and I have been shooting for them for the past 6 years now I think it is (this will be the 6th). Just hope I dont forget anything, it is going to be a bithard not having Larry there to help me with the computer side of things while I am shooting, but I have cards to hand out with my website on it and hope that if I dont get the time to do anything at the show, I will at least get some online sales. It is about 1 and a half hours drive from here (70 miles) and I will be staying with one of the members overnight so that I dont have to drive back and forth. I hope you all have a great weekend, will be thinking of you all. Hopefully I will have some nice pictures to bring back with me, they are predicting scattered showers all weekend and this is an outdoor arena. Yesterday I was so excited because I saw my pair of barn swallows again for the first time flitting around the big barn looking for a place to build their nest. I dont know why but there one from last year fell down, I thought it was pretty secure but obviously it wasnt. So now they are flitting around singing and looking for a new place. I meant to put that in my blog yesterday but forgot. 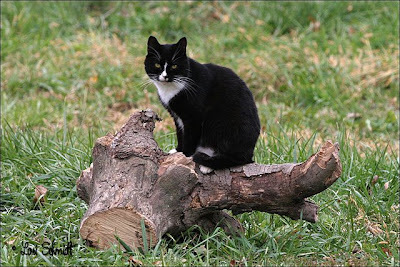 This morning our home health aide came in just before 8am and told me that my neighbor had hit and killed my Huggy Cat with her car and not even noticed. I am not going into details here but I am very upset and it is a sad day for me. This was the most loving soft cat I have ever known and came to me about 5 years ago from who knows where with the end of his tail all bloody like it had been shut in a door. I called him huggy cat because when you picked hm up he would lay as flat against you as he could and put his paws on each side of your neck like he was hugging you. He had severe allergies and as a result couldnt hear very well because he was always very congested. I will miss you my little friend. I may post again later but just wanted to post this for now. 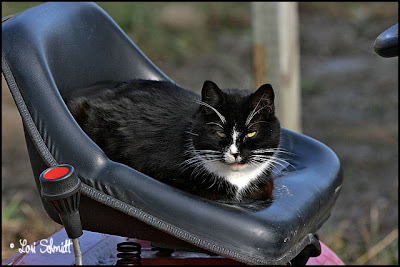 I know you arent all cat lovers but my 4 barn cats have been with me a while and Huggy made a great photo subject. I took these threepictures all within the last few weeks. Okay so now that I have bored you all to death with my in depth account of Dawn's and the railroad's antics, I will try to find something interesting to write about today. 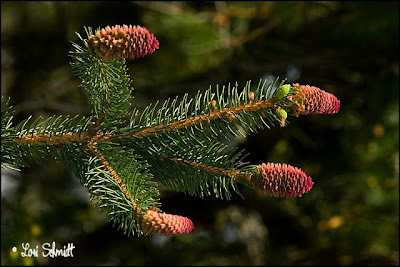 We have a big Douglas Fir/Pine in our front yard which was originally a Christmes tree that was planted over 55 years ago after Xmas was over by Larry and his family. Every year it gets these pink cones on it. Apparantly they are normally only on the higher branches but these were right on the lower branches too. This tree is about 40- 50 feet high now. 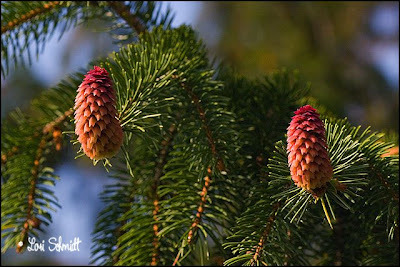 I didnt succeed in getting decent pics of the cones today as we had a lot of wind but here are a few to brighten your day. The railroad is getting going on fixing our boundary fence, how long it is going to take I dont know. I just hope I dont have any more excapes before it is done. I wanted to send these four mares to the pasture down the road this month anyway, the three two years olds and the black, and black and white mare because they all get on so well. Maybe I need to do that soon. I finally put the horses all out tonight again, they were so happy, it had dried out enough not to make too much of a mess and the grass or what there is of it which isnt much has had 3 days to sprout which will keep them hunting for tips of grass to nibble on. I think they are happier outside anyway. Another load of sawdust to unload tomorrow. I shoot my first horse show this weekend but have to stay away overnight because the cost of the gas makes it cost prohibitive to drive home for the night (about hour and a half drive). I will be staying with one of the members which will be great. 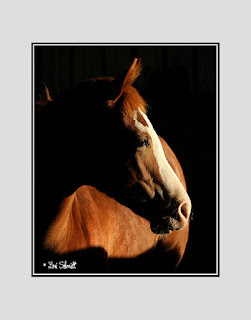 It is a pinto show (spotted horses or all shapes and sizes you can see last year's shows on my website still http://prophotobylori.com/ click on shows and orders, cant remember LOL. See y'all tomorrow. Susan enjoy your day with Cookie. I will be thinking of you. Well here is the culprit of all the panic on Friday. It is going to be a bit of a long story because there are lots of things that lead up to why she got on the other side of the fence. In fact this picture is taken with the railway track behind her in just about the place I had to get her back in! Ok for starters, it is my fault that this filly and her two sisters aren’t even halter trained, and have never been taught to lead, in fact they have run out in pasture all their lives, but with up to 20 horses at one time on my own, I have burnt out and lost most of my passion for something I have strived my whole life for, to own my own horse. 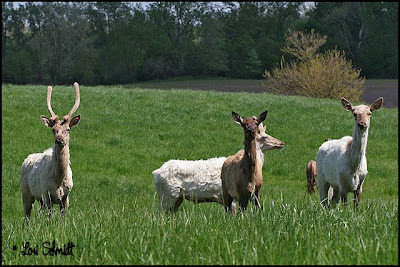 They are easy and respectful to be around, well mannered and calm so my job this summer is going to be to try to work one at a time so that each one can have a better chance of finding a good home. This will be the third year that I haven’t bred my mares much to my husbands disdain who believes a brood mare that is not in foal is not worth anything if you decide to sell her, but my argument is that there is such a glut of unwanted horses at the moment and we still have some of our babies from four years ago, why the heck would I want to breed more and cause myself more heartache at parting with them and finding good homes. I wont send them to sales so they can end up on the killers' trucks and have $200 in my hand if I am lucky. I am battling severe depression to top it off so it has been a hard few years for me. This first picture was taken when I first came here (click on any of the pics to see larger versions). The electric post and to the left is where this all took place and you can just see the pipe running under the railway line on the right where all the water from the whole district eventually runs either via the ditch along the track between it and the barn, and one that floods the bottom of my field every time it rains, so it seees a lot of water. 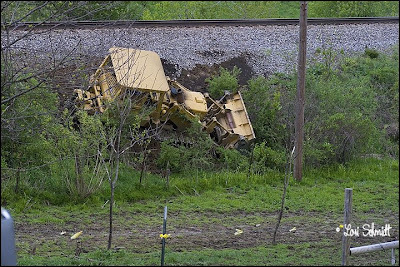 The next part of the build up is that a few years ago a grader tried to drive along the side of the track to get back to the road and got to a certain point where the gradient was too steep and it just started sliding down the bank into our fence. It is always wet here so the mud is terrible most of the time. Again instead of bringing their equipment into our field and hauling the grader out they drove a backactor down the length of the ravine between our property and the railroad and succeeded in making a mess like you cant imagine because half of the embankment that the track is on came down with it and it tore out all the foliage and trees and foliage that had protected the gully from erosion naturally for many years there as well, leaving a muddy mess. 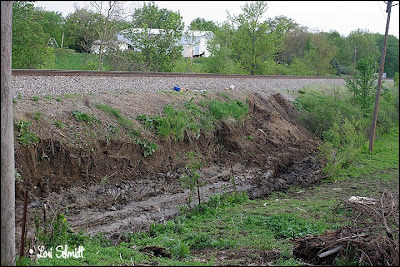 I was worried for the safety of the embankment that the trains run on because this stretch is right next to my barn and every time I see a train go by I see a little more gravel eroding away and sliding down into the ditch. We live next to one of the busiest lines in Indiana. We insisted that they repaired the fence immediately before we could put any horses out in the pasture, which they did a half hearted job on but it has worked thus far. 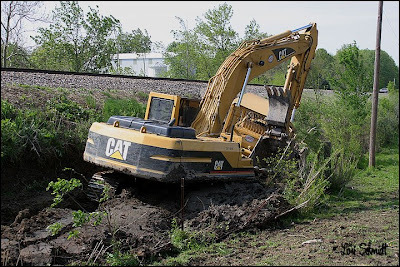 The backhoe tried to tow the grader backwards to follow the path it had already forged along the full length of the drainage ditch. 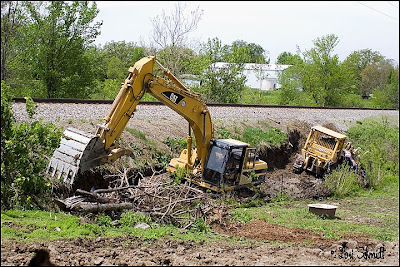 Of course all going to plan the backhoe broke one of its tracks and had to be repaired in that mess where it stood!!! It also cleared everything out of the path it needed to drag the grader up the drainage ditch back the way it came. The area below is almost exactly the stretch that I had to work with and where I got her back into the field, only the erosion is far worse now and has reached the gravel next to the track now. Larry called the Sheriffs Department to get them to notify the railroad that we had a horse loose in this area. One of the railroad employees came down in his little vehicle a few hours later to check that we had caught her and that everything was okay. So here the saga starts (if you have not fallen asleep yet) On Friday I popped into town quickly to take a friend to the shops so she could get some groceries for their camping trip and trail riding expedition this past weekend, the first of the season for them. 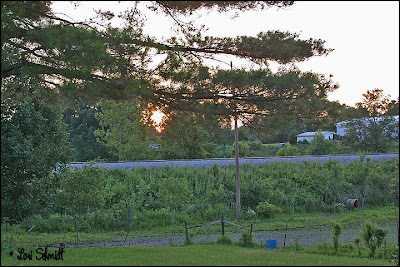 I arrived home just after 4pm and immediately noticed that Dawn was on the other side of the fence between us and the railroad. She was still pretty calm but of course the other horses were all excited and running up and down and bucking and making matters worse. I couldt find a break in the wire, I found a couple of spots where they had leaned over and pushed the level of the fence down trying to reach the grass outside the field as my pastures are non existent. The only thing I can think is that she stretched too much and tumble over the fence, thank heavens not getting her legs tangled in the wire. This stretch of our boundary is the Railroad’s responsibility to maintain and they had a 5ft square mesh like fence up which has been there for many years and is deteriorating fast. To cap it all they decided last year that after the ice storm we had a few years ago they were going to fix up all the trees that jeopardized the power lines and went to the extreme. They started clearing all the brush and chopping everything down along the fence line at ground level and leaving the branches just laying in the ditch, in our field and laying over the top of the existing fence. This then made it possible for the horses to get their heads over the fence, whereas before there was just too much thorny stuff and bushes for them to be able to get out of the field along that side. They even went so far as to chop all of the trees which were far shorter than the powerlines which were at the back of my old barn which needs the protection because it is deteriorating fast and exposing it to the elements was not a good thing. The only problem is that between our old barn and along the railway track parallel to the track there is a deep ravine which carrries a lot of the storm water from the surrounding acreage out of the fields down to the bottom of our field, through the pipe under the tracks and on into the creek on the other side. They just dumped these large trees where they cut them blocking the gully so I couldnt just walk her up the ravine without climbing the bank first. So here I am, in the rain and mud with horses flying all over the show, I got the halter on pretty easily and the lead rope and had a bucket of grain but now had to figure out how to get her out of there because the only way out north or south was to climb this massive bank, walk along the track and bring her round via the road or the neighbors property. She bolted on me twice which had me on the ground trying to keep her under control and she climbed up the bank and ran back and forth along the track. By now I was panicking. Richard our neighbor came to my rescue too but our efforts were pretty futile. I decided the only way that I was going to solve the problem was to cut the whole fence down in the area we were and hope that she would walk through to get back to her buddies. So off I go (bear in mind it is still raining LOL) to get the fencing tools. I cut the wire and had to shoo all the other horses because they wanted to participate and all I needed was for two horses to be out!!! We managed to coax her through and patch up the fence. What a relief. Then I started checking the entire fenceline which was eye opening because a lot of it which had been protected by the brush totally before was now exposed, corroded and only about 1 to 2 feet off the ground!!! So still in the rain and mud I got a roll of wire we have and strung up a strand about four feet up along the worst stretch and tied long orange plastic tape all along it. 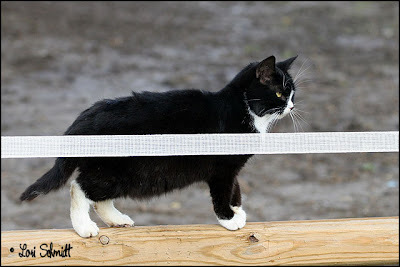 I always do this on the electric fences so hoped it would keep them away from it because they would think it was hot. I really think it was just a freak thing that happened but I didn’t want it happening again. The brush that they did leave there makes it impossible to electrify that stretch without cutting all the rest of the brush down. It will be a shame because it used to make a lovely green and pink and white hedge almost along the fenceline when the wild roses flowered and all the bushes got their leaves. Even got blackberries in there which the birds love. So that is our little saga, and of course we haven’t been able to get anyone from the railroad to respond to us so it is probably going to get nasty. 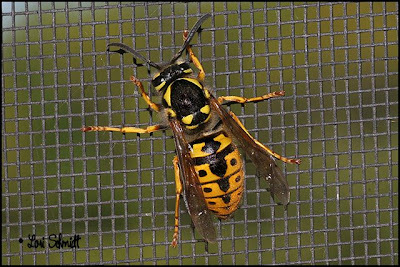 Just pray with me that I can get this fence fixed before I get another escapee. It is about a 600 ft length of boundary so is not going to be cheap to repair but is the railwroads responsibility to maintain thank heavens. I still have visions of me standing twenty feet below her while she was running up and down along the gravel of the track and hoping a train didn’t come along. Here is another picture of how thick the brush was last year, this is Taxes hiding from the first rains a year ago when he was 6 weeks old along the same boundary. Hope you all had a great weekend, we have had rain all day but I got some stock photos done for the agency. I have tried a few times today to upload and post here for today and keep getting all sorts of weird things happening when I try to put in pictures, so I will just put this note in for tonight, and hopefully I will be able to post normally tomorrow. I have to tell you the tale of the one two year old filly somehow getting over the fence along the railway track and her climbing the bank and running up and down the tracks with me having no way to get her back without help and cutting the fence!!! It all ended well but scared the heck out of me. ((((Hugs))))) have a great weekend all and hopefully I will be able to post normally tomorrow. We had another beautiful day today, not cold but not hot and beautiful sunshine most of the day. I eventually managed to convince myself at about 5 to go and put the two stud colts into stables and let Taxes out into the fenced area for a run. I cannot believe how big he is. He is the same size as the two year olds!!!!! He is still naughty though, and now that I am hopefuly improving I am going to have to start working with some of these horses. If you notice (click on the image to see a bigger version) he found a short stick and was running around with that in his mouth. He is one of those horses that has to be doing something with their mouths, some horses are not happy unless they have the lead rope in their mouth. He was full of beans as you can see. When he had had his bit of turnout time I put Gee out to run and gave her hay out there but she wasnt interested in it. She hung around the gate into the barn. She obviously feels insecure in an unfamiliar place and wants to stay as close to what she knows. I lead her out a few times to get her to move away from the barn and see if I culd get her running and letting off steam. She eventually did and I couldnt catch her when I wanted to bring her in LOL. After her little excursion I put Blue out for his run around and exercise. I need to make a daily thing of this, with 4 different horses needing to share the area at different times it is hard. to keep the balance. I am hoping to be able to take 4 or 5 horses to the other pasture down the road soon which will also be a relief. Will try to arrange that tomorrow. Other than that I think we are in for a very nice spring for a change, and hopefully it will last longer than usual, fingers crossed. I think the first cutting of hay will be on schedule, it is just a matter of seeing if the farmers will bring their prices back down a bit. Larry is goig to visit his plastic surgeon tomorrow at 1 so the day will be pretty much taken care of with the trip up and back and the appointment. I am really struggling to focus as you might have noticed. If anyone still comes to check here from time to time thanks and drop me a line so I know I still have a few blog buddies LOL. Today's pictures arent too pretty but it is what surrounds us at the moment. 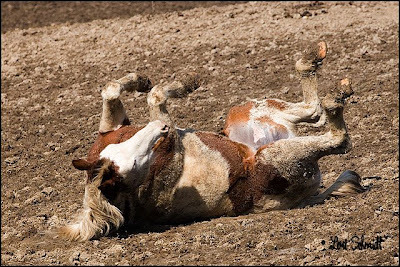 Although the mud has dried up just about completely and we are having the odd shower of rain, the small acreage we have is not nearly enough to accomodate 11 horses, so as you can see, here is Wiggle having a nice roll which helps her get rid of her itchy winter hair and she loves to do. There is not a blade of grass to be seen in the fields. This second picture is one that I shot for stock the other day. 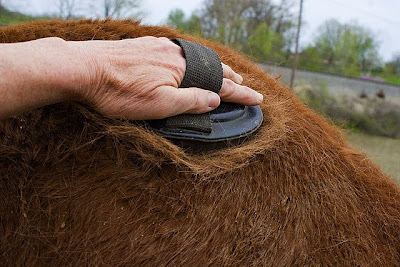 The three two year old fillies spent the whole winter with access to the outdoors and a shelter and had thicker coats than the others and this is how much hair is coming off of them with plenty more to come!!!!! I watched the Kentucky Derby this evening with great anticipation only to be saddened by the fate of the filly who came in second. So sad, her owners and trainers must be devastated. I didn't know her and I am, but then as you all know I am a soft touch for any animal especially one in distress. Nothing much happining here at the moment, the lilac bush is in flower, I will try to get some shots tomorrow if the wind lets up, it has been very gusty. I may set up a small studio because a friend gave me some peacock feathers and I am dying to shoot some pictures of them, so I can perhaps pick a sprig of lilac and get some shots of it too in good lighting. I have been diligently working on archiving my photos and catagorising them all, and choosing some of the better ones for stock photos to send to the magazines and agencies. I try to do a few a day and it also helps me to just switch off and keep my mind occupied and not feel sorry for myself. The horses are all fat and sassy and happy despite their slightly reduced rations (feed has tripled in price) and they spend all of their time outside so it has eased the burden on me as far as the stables goes. Gee is still with us, she still hasn't gone to the track so I dont know what her owner is doing but I love her to death anyway. Taxes is as big as any of my other horses and he is only just one year old. 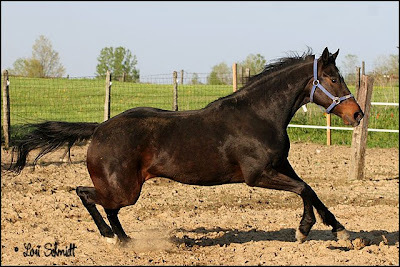 I need to get him gelded but just have to find the cash to to it, as well as Blue. Taxes is still as pushy, nippy and naughty as ever. I will post an update pic of what the wound looks like now, amazing when you think how it started. (((((Hugs))))) to you all, I do visit the blogs from time to time but dont always get time to leave comments.